The apartment El Cono is in a very quiet residential complex in the sunny Playa Paraiso. The apartment is modern and has 65 sqm. 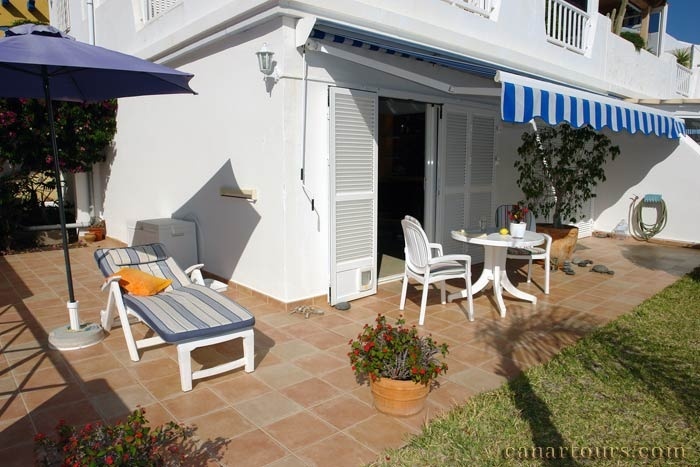 The sun terrace is very large and is furnished with patio furniture. An awning provides shade. The living room has a comfortable sofa, a television with satellite TV. The kitchen is separated and open optically by a breakfast bar to the living room. All necessary cooking utensils and kitchen appliances such as microwave with grill, oven, toaster, coffee maker, kettle, etc. are available. The bathroom is spacious and has a shower and washing machine. One bedroom has a double bed in the size of 150cm x 200cm and the second with 2 single beds 90cm x 200cm. Towels and sheets are included in the price. There are ironing board, iron and hair dryer. On request a cot and high chair can be made available. Internet access via WiFi available. There is a community pool at your disposal, which is heated during the winter months. Price: The daily price for 2 persons is 60€. In the period from May to Sptember 55 €. Each additional person pays 10 € per day now. The final cleaning costs one extra day's rent.